emma lamb: shoptalk : moo-tastic! Yay, I have some fabby new business cards from Moo! A spot of punching, threading and stitching later, et voila! 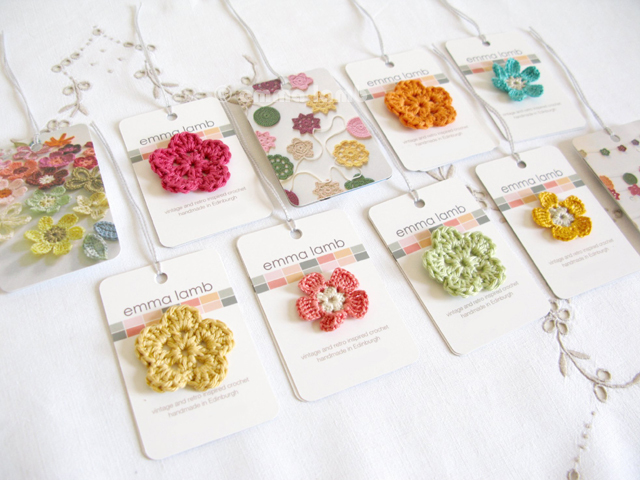 A batch of spiffy new swing tags for some of my crocheted wares!) I say some because I'm reserving these for my wholesale orders, at least for the time being anyway as I still love making the name tags for the ladies in my own wee shops (so need to fret! ), but while my products are exactly the same I think it will be a wee treat to have a distinguishing difference between the two. I love that they look a wee bit more professional yet still have that essential handmade touch. Oh they do make me happy! Hehe, isn't it funny how a girl can get so excitable over a wee business card or a swing tag!? Such a great idea! I love LOVE my MOO cards. They look gorgeous Emma! I ordered a sample pack from Moo after Erica (Hogenbirk Knitwear) talked about them on her blog. And now I see how great yours look I can't wait to order some. They are so beautiful. Show off your wares perfectly. I am a scrapbooker, so anytime I receive a beautiful purchase that comes with such a pretty tag it always gets included in my scrapbook. You are on my want list. Jo (nestingmyappletree), I use a very old version of photoshop or Big Huge Labs mosaic maker through Flickr to put together my collages. I hope that helps... !? 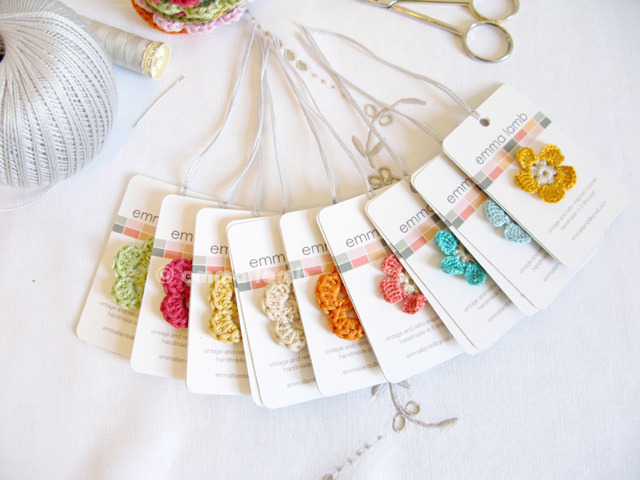 Your new cards perfectly send the message of your beautiful crocheting, Emma. 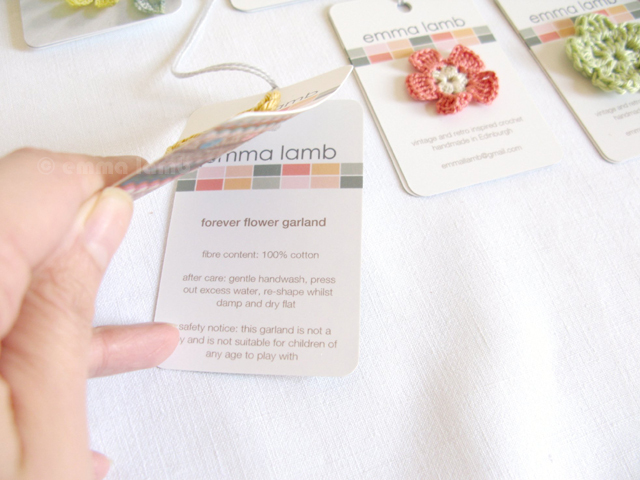 And your idea of also using them, with embellishments, as hang tags is brilliant. A perfect fit. They look fab! Last few times I ordered from Moo I got the minis, but I'm loving the rounded corners. Very impressive! wow! These are amazing! Such a fun and creative idea! They look aweomse, especially with the flowers on them :) Nice design! These are sooo beautiful and sweet! You continue to inspire with all of the beauty that you bring into the world. Thank you! They look lovely! That's such a good idea. And the crocheted flowers on them are so sweet! What pretty cards you produced. I love that you personalized them with some handmade lovelies. They would make a pretty Harland as well! They are so, so, so pretty! I think you're very wise to put them on the wholesale orders. 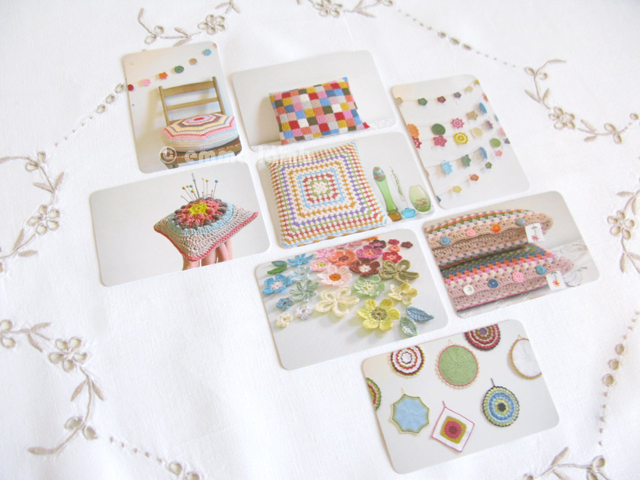 You're products and photographs are already so beautiful they absolutely shine on MOO cards. I love MOO too, such a great product. I am loving the subtle colours on your moo cards ... very you! 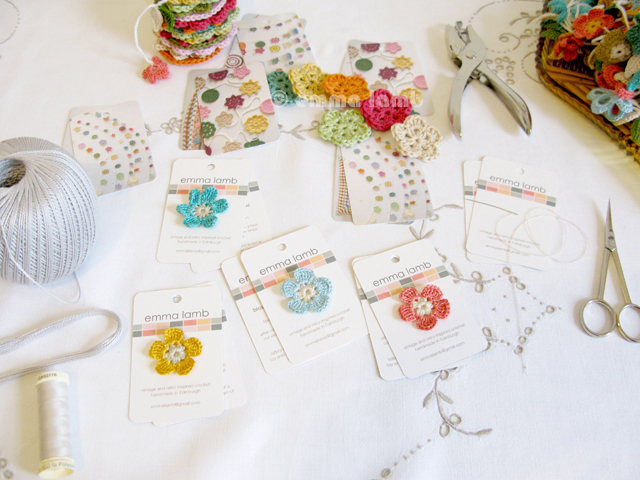 Absolutely love your new business cards and with the crochet flowers it's a beautiful presentation.